President looks back on successful first year. Headwater Companies LLC, the wholly owned distribution segment of Franklin Electric, recently celebrated its first year in business in April. And it’s been a busy first year. The company, which is a collection of groundwater distributors, began 2018 by announcing it had acquired Valley Farms Supply Inc. of Lansing, Michigan. Valley Farms is a groundwater distributor operating four locations in Michigan and one in Indiana. DeLancey W. Davis, president of Headwater Companies and executive officer of Franklin Electric, heard concerns from industry distributors about succession plans and the ability of these supplier businesses to support water system professionals upon leadership’s retirement. 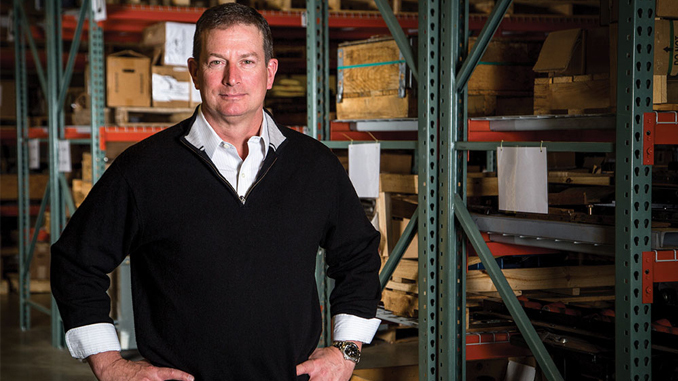 Franklin Electric wanted to invest in ensuring the groundwater-focused distribution channel grows and Headwater Companies was born. On April 11, 2017, it was announced that 2M Co. Inc. of Billings, Montana; Western Hydro Holding Corp. of Hayward, California; 2MDSI (now Headwater Wholesale) in the Upper Midwest; and Drillers Service Inc. (DSI) of Hickory, North Carolina, would operate under the entity Headwater Companies. Water Well Journal spoke to Davis, a 26-year groundwater industry veteran, about how the first year has been and what the future holds for the company. Water Well Journal: As Headwater Companies recently celebrated its one-year anniversary, what has the last 12 months been like, both as a company and personally? DeLancey W. Davis: The company’s experience has been exhilarating and stressful. As a combined company, we have over 14,000 customers, over 500 employees, and over 2200 vendors, and we did not want to disappoint any of them during the transition. We had 18 healthcare plans, three 401(k) plans, and three separate operating systems. We’ve been working methodically to consolidate into unified systems and plans. Personally, I’ve been honored to work with such great professionals and to be part of the team that made the Headwater Companies such a success. WWJ: What has the response been like from water well contractors now working with Headwater Companies to purchase their products? DeLancey: Spectacular. There is a fundamental symbiotic relationship between contractors and their suppliers. As we transitioned our focus to our best-in-class manufacturing partners, our customers were strongly supportive and reinforced to our salespeople the importance of our professional and personal relationships. They understand and support the huge investment that we’ve made in the industry and appreciate our commitment. It certainly helps to represent some of the best manufacturers in the industry. WWJ: Headwater Companies has already shown growth in the first part of 2018. How do you foresee the rest of the year taking shape? DeLancey: We see growth in our core groundwater and agricultural channels. Business conditions generally seem to be favorable, many of our customers are reporting significant backlogs, and we are excited about growing in other key markets such as residential/commercial irrigation, water treatment, wastewater, drilling supplies, and commercial/industrial markets. We anticipate significant organic growth this year. We are very excited about the addition of Valley Farms Supply to the Headwater Companies and continue to discuss opportunities with other distributors interested in our business model. 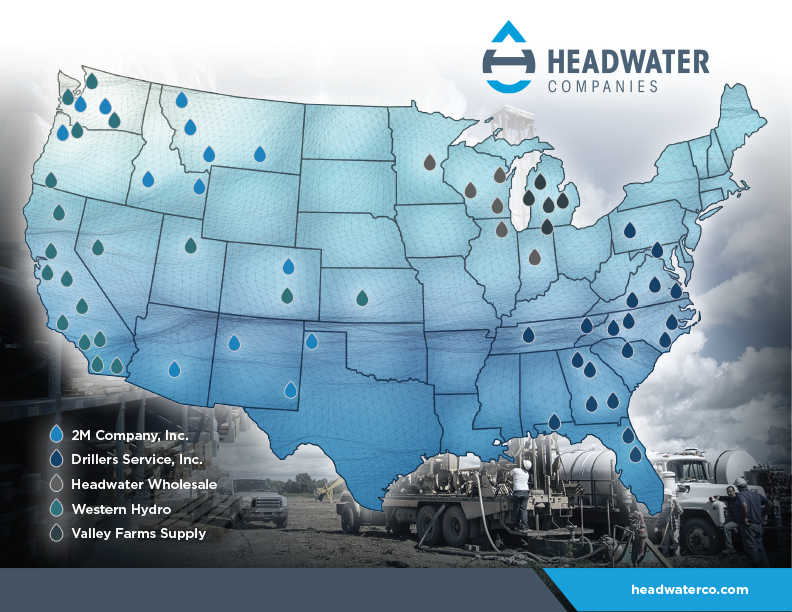 WWJ: Most of the locations of Headwater Companies are on the east or west coasts, respectively. Is the Midwest part of your future? If so, how do you see that happening? DeLancey: We certainly hope to expand our presence in the Midwest and other regions, but it’s dependent on potential partners in those regions. If Headwater provides a long-term solution for a potential acquisition candidate and they are a good fit for us, then it will most likely happen. However, we have quite a bit to do with our current portfolio of companies and ensuring our customers continue to see we are focused on their business. WWJ: This issue of WWJ focuses on irrigation and groundwater. What have been the most common irrigation products sold by Headwater Companies? DeLancey: We run the gamut from pipe, wire, sprinkler heads, and controls to line shaft turbines and sub-turbines, motors, controls, and drip systems in large agricultural and dairy applications. Solar-powered products have also been a growing line for us in irrigation. WWJ: What is your biggest concern about the irrigation market and groundwater today? DeLancey: First and foremost, to make sure we have every product available all the time and ready to ship to our customers. Availability is key and our manufacturing partners are focused on this as well. Beyond product availability, we need to make sure we provide the best service, training, and product support to our customers. Certainly, we stay involved in regulatory issues on local and national levels to ensure we are strong stewards of groundwater. Weather is out of our hands, so as business people, we focus on managing what we can control and adapting to what we can’t. WWJ: News from Washington, D.C., points to an infrastructure plan being discussed. How do you see this impacting Headwater Companies and the groundwater industry? DeLancey: Infrastructure investment is generally good for our industry. The needs only continue to grow and funding is always lacking, particularly in water infrastructure. However, it is important for all stakeholders to make sure we are informed about recent changes, such as the Savings Act, and the great potential it offers to communities and professionals focused on water systems. WWJ: Lastly, what has been the general tone from water well contractors regarding the future of the industry? DeLancey: Our customer base tends to be leaders in their respective markets and invest time and money in their companies and the industry. We seek a lot of advice and insight from as broad a cross-section of customers as possible and generally we see well-run companies that are expanding, either organically or through acquisition, and successfully transitioning to the next generation of company leadership. The general tone from our customers is positive and optimistic about the future. Headwater Companies is just focused on trying to keep up with them. Mike Price is the senior editor of Water Well Journal. In addition to his WWJ responsibilities, Price produces NGWA’s newsletter and contributes to the Association’s quarterly scientific publication. He can be reached at mprice@ngwa.org.